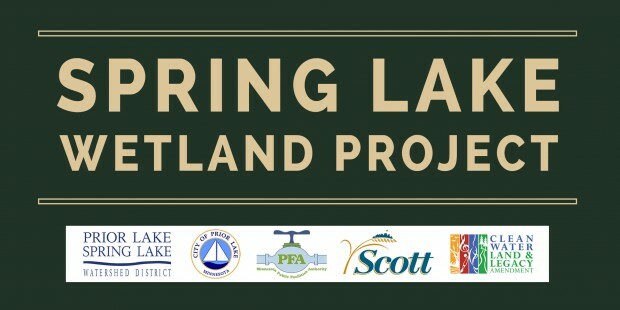 Prescribed burn was successfully completed at the Spring Lake Wetland from 1pm-4:30pm on April 5th. Find the Prior Lake American news article 4/5/17 here, along with a cool video of the burn here put together by their reporter, Hannah Jones. 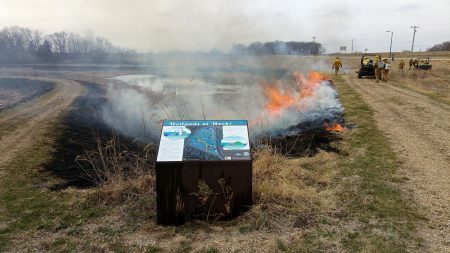 The Prior Lake-Spring Lake Watershed District is working with restoration specialists at AES to complete a prescribed burn at the Spring Lake Wetland (a.k.a. 12/17 Wetland) at the southeast corner of the intersection of CR-12 & CR-17, across the road from Sailer’s Greenhouse. The prescribed burn will take place TODAY, Wednesday, April 5th, if the weather conditions remain favorable. Prescribed burns are one of the management tools that are being used at the Spring Lake Wetland to maintain the native plantings. Fire is an important aspect of vegetation management because it helps suppress non-native, undesirable plants, and is needed by many native plants that require fire for ideal growth. The prescribed burn is being used in combination with mowing, herbicide application, biological control and native planting/seeding to successfully restore the site. As a relatively young restoration site, the prescribed burn at the Spring Lake Wetland is anticipated to be a lower fire with a spotty patchwork of burned areas. Unlike mature prairie burns that can run hot and high, this burn will be less intense, helping to control the cool season, non-native species and encouraging native plant growth. During the prescribed burn, residents may see smoke and flames. The fire will be carefully managed at the site and all nearby neighbors will be notified. AES has obtained all necessary permits required for the prescribed burn and will have MN DNR trained staff on site along with the necessary fire control equipment. Specific weather and environmental conditions must be met to implement a prescribed burn including: the optimal prevailing wind direction, humidity levels and cloud cover conditions. Although the Watershed District is hoping to complete the prescribed burn today, it may get delayed if the weather does not cooperate. If you would like to be added to the email list for up-to-date information on the prescribed burn, please contact the Watershed District at mskarschnia@plslwd.org or (952) 447-9808. 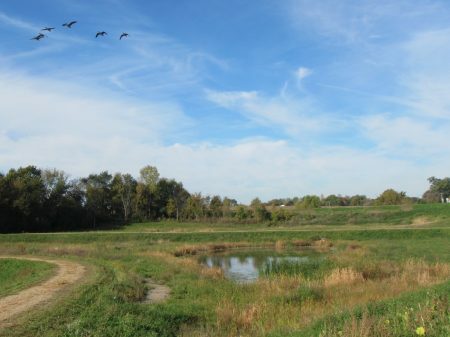 The reconstruction of County Road 12 and Sunset Avenue in the city of Prior Lake afforded the District with an opportunity to improve and increase a wetland with marginal resource benefit which included an agricultural drainage ditch. The project is now almost complete and will enhance flood control and capture phosphorus and sediment before they reach Spring Lake and other downstream water bodies. It will also treat runoff from two highways , city roads as well as an upstream 60 acre agricultural area. The District will continue to monitor and maintain the vegetation around the wetlands until it has been successfully established. 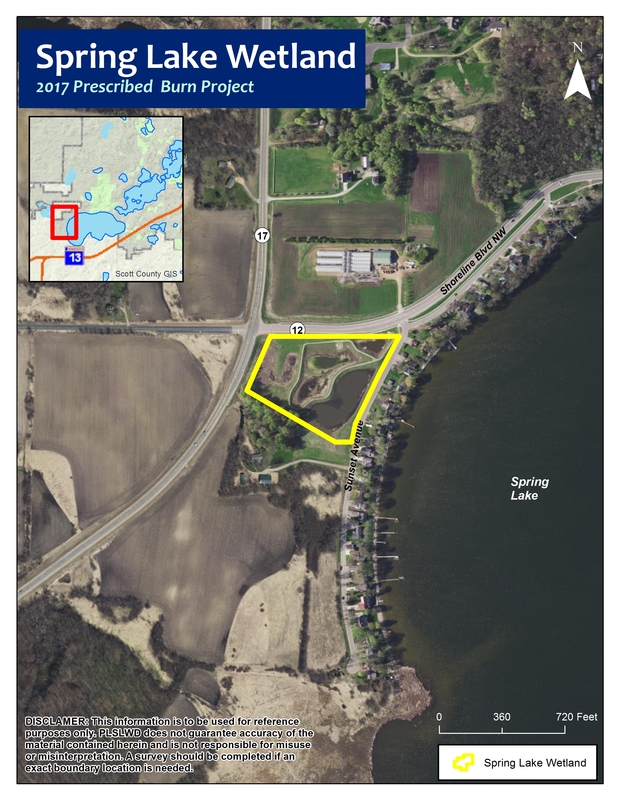 Also, a carp barrier has been designed for this location and will be installed this fall by the City of Prior Lake. 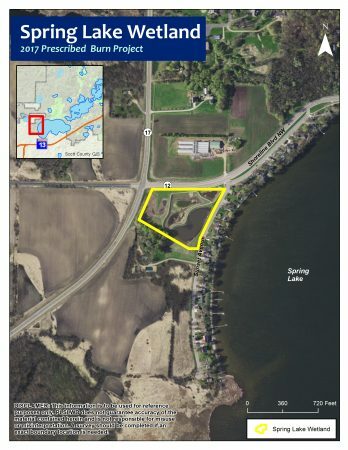 The District will also be working with the City of Prior Lake to place two interpretive signs at this location, explaining the many benefits of the improvements that have been accomplished at this site. The County Road 12/17 road reconstruction is nearly finished and the grading and remaining construction for the wetland is expected to continue in January 2014. When complete, the wetland restoration will include new community amenities, like walking paths, and iron-enhanced sand filters. 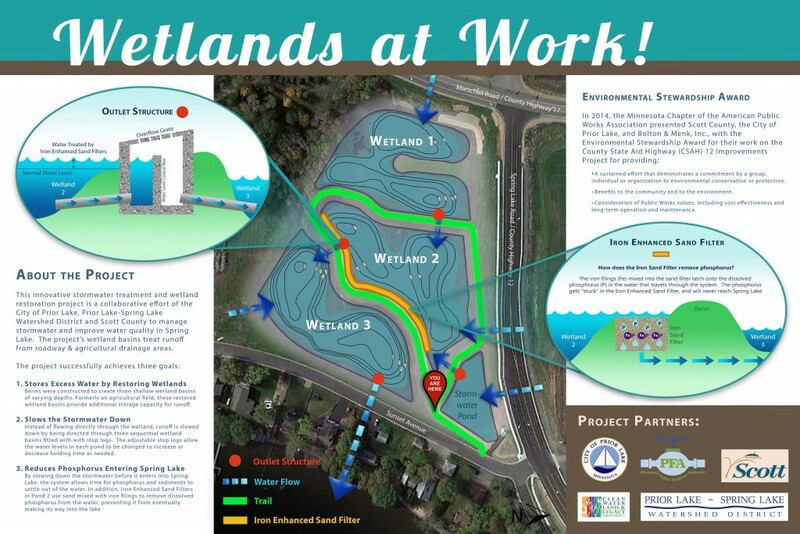 Iron-enhanced sand filters are designed to remove phosphorus from stormwater and will help reduce nutrient loading to Spring Lake.